Believe it or not but you can trace your roots without dipping your hand in your pocket. In this post I want to show you 15 ways that I have found where you can conduct free genealogy research. You don’t have to try them all but certainly check out the ones that interest you! Taking your journey one step further! I recently wrote a post about where you can find free genealogy resources. In that post I discussed 8 resources that can be found online, and all of which are entirely free! In this post I want to go one step further and discuss everything and anything that will help you to trace your ancestors and which won’t cost you anything at all. Here I will briefly discuss those 8 resources from my previous posts as well as 7 other ideas that you may not have thought about. If there is something though that you think that I may have missed then please feel free to comment below the post. At the end of some of these methods and resources you will see a link where you can find further information. If you have just started to trace your ancestry then I must say that you are in for a really exciting family history journey. With each step that you take you will discover new family members and branches to add to your tree. There’s quite a lot to discover. But before you begin your journey you need to take that first step. And that first step begins with you. From my own ten step guide to family history research I suggest that you write down everything that you know. This will be about yourself, such as your name, where you were born, who and where you married, and so on. You then continue to do this with your parents, then grandparents, and then great-grandparents if you do know anything about them. The next part of this initial step on your own personal family history journey is to take a look around your home. There will be an abundance of material that you can use for your research. As you can see there is plenty of useful information all around your home that you can use. If you are lucky enough to find any these items in your home then that is great as it will save you both time and money as you will not need to got out and get them. Interviewing family members and anyone who may have known your ancestors is a great way to get valuable information about your ancestors. Besides learning about the life of your ancestors, their achievements, their stories and tales you can also get documents and artifacts from them as well. The resources that I mentioned in the previous method may also be available to you if your relative, or family friend, has them in their possession. Of course, you will need to ask them kindly. You will need to think about where will the interview take place, how you will conduct the interview, how you will record what is said and what questions will be asked. That is why you should check out the following link. This is sort of a continuation from the previous method. It may not be the ideal way for you but it can be for some. And that is why I have included in this list. If it is your birthday coming up, (or maybe Christmas), then why not ask for something genealogy related as a present. Of course, it all depends on whether you are comfortable telling your family and friends what you would like for a present. If you receive money then that’s great as you can use that to pay towards ordering certificates/documents that can help expand on your family tree. Or you could use that money to buy genealogy books or a family tree building software, subscribe to a genealogy search website, or get your DNA tested. Next why don’t you check out what valuable resources that there are around you. I am talking about your local library or archives. The library is a great resource that is available to you as there should be a genealogy section available. And on top of this there should be a local history section as well which can give you information about the area in which your ancestors grew up in. Not only can you check out the books and borrow them for a limited time, but you can use their computers as well. If the library has received government funding then they may have connection to genealogy search sites such as Ancestry or FindMyPast. I have visited my local library many times to jump on the computer and accessed these sites. I have expanded my family tree so much because of this method. Also, genealogy societies can be really helpful for your research. They do require payment if you wish to join but if you are asking a few questions then they may help you free of charge. Now this may seem morbid to visit the graveyard of your ancestors but it can help you to break down any brick walls that you may have encountered in your research. If you’re stuck on a date or a family member then chances are that you can get that information on the gravestone of your ancestor. Of course, you need to know which cemetery to visit but if you know where your ancestor lived then you can check out the cemeteries near to where they resided. There’s a plethora of books available that can help you with your genealogy research. These books can range from helpful how-to guides to personal family histories to guides on where to find what information that you are looking for. During my research on where to find such free books I have discovered 6 sources online that can help you to track down the book that you are looking for. Learning from the experts that have been there and done that can certainly push your family history research along. From them you can learn new skills, tips and tricks. They can even help you with a brick wall in your research that you may have encountered. I have come across some classes that you need to pay for but if you are reading this then you probably want something that is free. Following on from the previous method you may need specific questions answered. You may need to know exactly how and where to look for whatever you are searching for, or you may have come across a dead end, (no pun intended). You would expect to pay for such a service, but I can tell you that there are services out there which can help you with your problem. You are probably aware that there are genealogy search websites out there that you need to pay a subscription where you can access genealogical records. For either a monthly or annual fee you can access these records which no doubt can help you to build out your family tree even more. But as with other sources that I have shown you there are in fact free sites that you can visit where you possibly can find what you are looking. I say ‘possibly’ because there is a chance that what you are after maybe free. It doesn’t hurt to look to see if you can get the information that you are after for nothing. OK, you’re probably scratching your heads with this one. After all this post is all about where you can get information for free, so why would you go to a paid site for that. Well, surprisingly you can get genealogical records for free at some subscription sites. And I know 4 different ways that you can do that. Free Records – Some sites do actually offer some records for free. Free Trial – To get a taster for the site generally a 14-day free trial is on offer. Free Weekend – Usually occurring during holidays genealogy sites will open the gates as it were to their records. Your Local Library – Yes, try to visit your library, log on to their computer and maybe they have a free connection to a genealogy site or sites. One thing that you will definitely need while you research your ancestry is a tool which can help you to create and build your family tree. There are really good genealogy software programs that are out there such as Legacy and Family Historian. What you will find with these programs is that they really can pack of bunch with all the tools that are featured in them. But if you are just starting out then you will probably want something that is free. The tools and features will be limited but they can certainly help you to start tracing your roots. Recording information that you find on proper forms and charts is essential when you are researching your family history. You don’t want to be scribbling on a piece of paper, writing down everything that you find. That approach would certainly get messy pretty quickly. Similar to a genealogy software program you need a way to record what you find. And that comes in the way of forms and charts. Now this probably has piqued your interest. As you most certainly will be aware, due to the many Ancestry adverts that we see, that DNA testing can push your research into areas you thought you weren’t possible. Whether you can get a free DNA testing kit does depend on where you live and what you want the test to reveal. There are several other kinds of such kits besides testing your genealogy. But suffice to say you can get a free a kit for specific surname research. A word of caution though as you may get the kit for free but may have to pay for the testing. If you have already had your DNA tested then that’s great. You must be pretty excited with what you have uncovered with your results. But did you know that you can find out even more information with the DNA data. You just need to download the raw version of your results from whichever testing company that you purchased and then upload them to an external sites. You would think that such a service would cost you. But you would surprisingly be wrong. When compiling this list of free methods and sources it did quite surprise me just how many ways that there were. Hopefully I have included every possible avenue of research that can be used and which is free. But if you feel that I have maybe missed something out then please feel free to comment below. Before I go though I would just like to say something. Obviously everyone likes free. And why should you pay for something when you can get it for free? It doesn’t make sense. So, when you are starting out on your family history journey please do check out these 15 methods and resources before you go handing over your money. There will come a time when you will need to part with your cash but if you don’t have to then why should you. If you are looking for more free genealogy sites then head on over to Family History Daily. 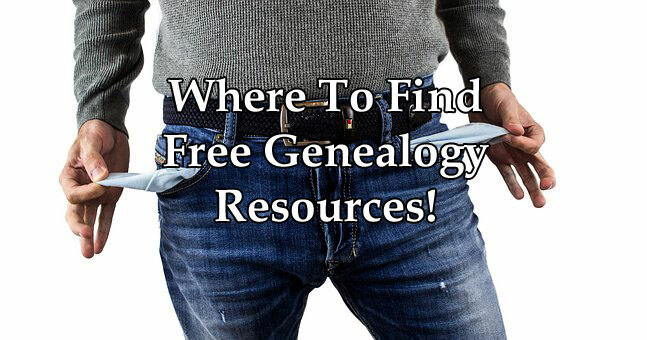 There you will find a guide to 50 Free Genealogy Sites to Search Today. I hope that you find it helpful. I hope you enjoyed this post showing you how to conduct free genealogy research. If you have any questions or comments then please leave a comment below. This is very interesting and informative article. You must have put a lot of effort into researching and writing. My cousin started to research our roots a few years ago but I’m not sure whether he found out what he intended. Thanks for reminding me to check it out and maybe I can share few of your tips with him. Cheers! Thank you for your comment. Yes I have put in a lot of effort. As I traced more and more of my family tree I found more and more avenues of research. And using what I have discovered I have compiled this list of where you can find information about your ancestors for free. It really is impressive just how much information is available. So it is definitely worth checking these free resources before you spend your money. An interesting post.. I m very fond of knowing my ancestrial history.. Asked my family members but all know about 4-5 generations back, heard for the first time through your post that even ineternet can help us in geneology..
That’s a great start if you know between 4 and 5 generations back. Some people know only to their grandparents so it looks like you got a head start there. I wish you all the best and please let me know how you get on. These are some great ideas. It can be a little daunting trying to conduct genealogy searches, especially if you do not have any idea where to start. You have given me some ideas I had not thought of. The cemetery is definitely one I had not thought of. I also like the list of free genealogy websites. Many of those I have not heard of so I have been going back and forth to them already. Thanks for sharing. You’re quite welcome Nate. Obviously start with yourself, then parents, and then grandparents. And from there just choose which branch you would like to trace. Take what you learn and then apply it to another branch. Of course you can use any number of these ways, or all of them if you choose. It’s entirely up to you. Yep, there are certainly a lot of different ways here that you can use to make a start on your family tree. The important thing is just to take your time and enjoy the journey. Although hunting your ancestors can be quite an adventure. It wouldn’t surprise me if you stay up in the small hours discovering all sorts of information about them. You’re very welcome Karen. I hope that you do find out a lot about your ancestors through the sites that I have suggested. And when you have finished with them then please check out the other methods too. Wow, what an informative article! As I was reading through your section on looking around your home for bits of history, it reminded me of my grandfather and the German guns he used to keep hidden at the top of his closet from WWII…there truly are dozens of ways to find out about your genealogy for free. Thanks for sharing! It is surprising just how many different ways that there are for tracing your family history. So before you do spending your money please check try these ways. Who knows what you will discover.